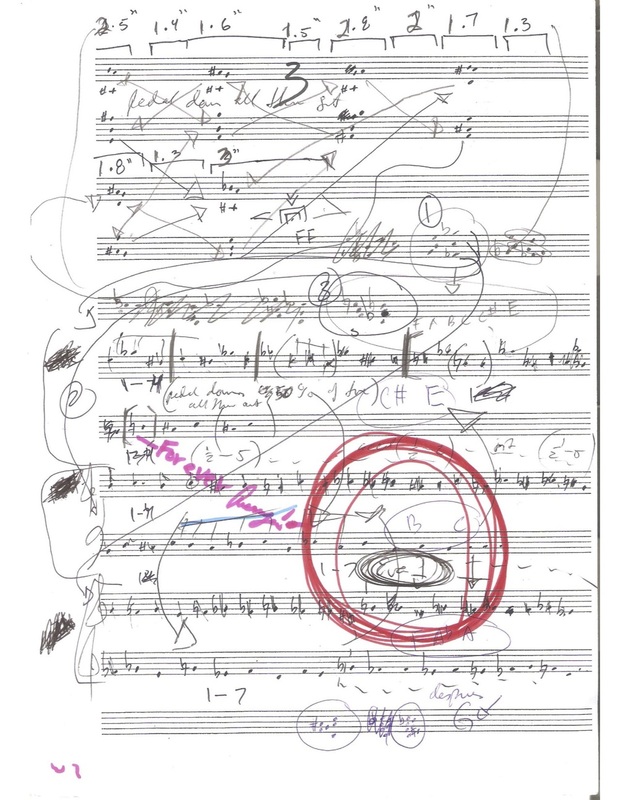 A musical composition process based on a research on chaos triggered by the question or concept of reality being an abstraction not reality itself. This process is based on using Sound Scores bypassing an abstraction that is less informative than the one used to achieve a goal. In this case is in order to achieve a direct connection to what chaos is derived from sound scores that carry an immense amount of information. This characteristic is associated to the description of the Greek deity Chaos, an unformed matter or substance which from it reality comes forth through abstractions or concepts that are created and or extracted by the human. Here the performer is the human being that gets informed by the chaos in the atmosphere or in this case the sound scores and then he plays what he listens and finds appropriate for the instrument he performs. This process's output is an Abstraction of the "Sound Score" performed and given by instrumentalist with his or her given instrument. The goal is to attain as much similarity in the Transduction process to the original Sound Score material as posible and to get new information or sounds from the same Transduction process. Emotional content and a multiplicity of readings are considered in order to perform pieces created through this process. The noise is a flower that Queseyoqué* gave the whole wide world to integrate from ( _____________ ) to extract beauty. Queseyoqué is a slang word for I don’t know what in spanish*. This is one of a series of Sound Score pieces using Transduction technique. This specific piece is intended to have the experience of listening to noise while abstracting, creating, discretizing, or all synchronically with a metaphor or approximation of noise. Noise is theoretically all frequencies with the same probability. This is approximated by lehemer function generating “noise” which is chaotic equations. The Noise is taken as a symbol of everything in a disorderly state or not graspable consciously. Greek God Chaos is defined in the same manner as being the beginning of everything. The ideas of chaos and creating music based on chaos were the engines for this composition. We research here the possibilities of a composition with these specific definitions; Chaos as the noise, as the disorderly state. Since “noise” is theoretically a chaotic function here the square root is meant as a symbol of extraction from ______ or . This _____ (state/substance/object…) are represented as the Noise. It does not exist, is always an idea approximated through chaotic functions in signal processing. How we create or form material from this “vast” and “wholy” substance as everything?. We have a liminal and a gestalt experience based on our condition. We, as in the performer, reach for melodies inside the noise. We reach for rhythms inside the noise. We reach for timbers and harmonies. We reach for emotions. We reach for philosophies. We reach for ideas. We reach for instructions. We reach for anything that is possible to reach concerning ones condition. Chaos here is reaching the noise. It is the closest abstraction to what noise can be. This gesture of extracting from the ________or is derived by the square root symbol and some derivations. In this composition the mathematical notation, √- is borrowed from the idea of the imaginary number. √-1 = i. This idea was continued with √-i = ? or _____ or . This idea was continued with √- . This is the name of the piece. The mathematical function for me represented a demiurgical characteristic that a composer has in his life. 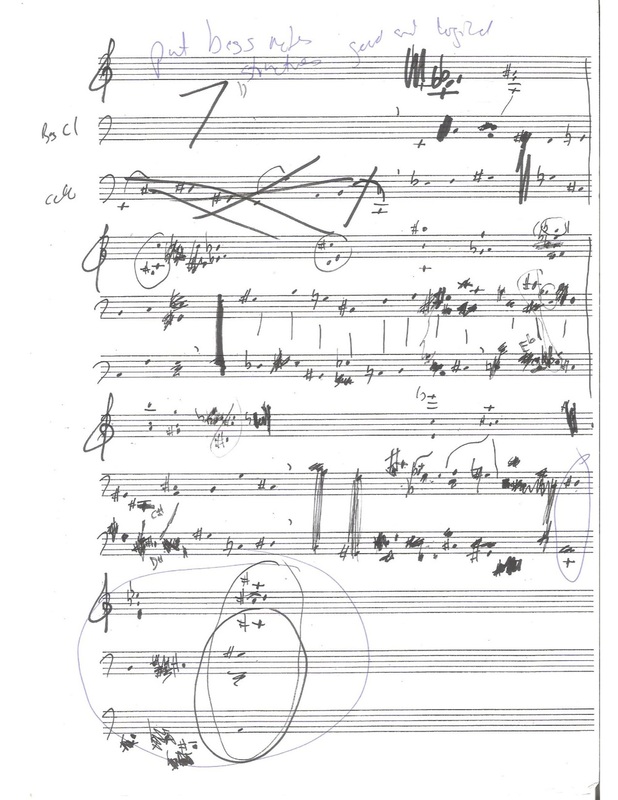 The extraction, creation or both synchronically, of elements for his music, are represented in the performers but now with a substance that is an approximation of an idea of everything. This substance interacts with the performer and the performer senses indulges in what he might be able to play from the complexity of sounds, in this case, the noise. If the performer does not find anything relevant or any instruction from the sound score solely then this performer will not play until that happens. String Quartet #1 - exploring new extended techniques for multi phonics in one string with pressure from the left hand. String Quartet #1 - exploring new extended techniques for multi phonics in string instruments using pressure.